Prepare to Storm Normandy’s Beaches! Morning of June 6, 1944. The fate of Europe is in your hands! 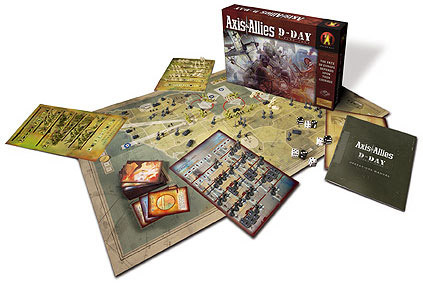 Presenting Axis & Allies D-Day, a new, stand-alone extension of the classic strategy game Axis & Allies. Axis & Allies D-Day lets players to command, or conquer, the largest amphibious invasion in history. 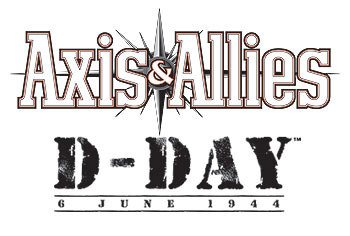 Axis & Allies D-Day features detailed game components including a new blockhouse piece and an oversized game board. Other elements of this new Axis & Allies variant include a card deck with three card types — Orders, Tactics, and Fortune — adding depth and complexity to gameplay. Order cards determine play sequence and break turns into distinct phases; Tactics cards offer players varied strategic opportunities; and Fortune cards add an element of unpredictability. Axis & Allies D-Day begins as Operation Overlord, the invasion of German-held Normandy — 130,000 soldiers of the United Kingdom, Canada, and the United States poise to assault Fortress Europe. You and your fellow world powers control their fates. One player controls Germany, whose Axis forces have turned the beaches of Normandy into a near-impenetrable stronghold. Set to breach those defenses are the Allies: the United Kingdom, Canada, and the United States. I picked this up cheap mainly because of the nostalgia that I have for Axis & Allies. I like the idea of a shorter scaled up version. This game is very scripted. The order of play consists of playing 16 order cards in sequence which limit your choices, for instance one card is for firing from blockhouses, another card is for moving your land units from a beachhead space to its corresponding zone. There are advanced rules that add additional fortune and tactics cards which provide some randomness to each of the order cards. This game is 2-3 players, but I think that the “engine” of this game makes for a reasonable solo game. I like what they are trying to do here, the scripting makes for a pseudo-historic feel. There aren’t quite enough decisions here to make this a great game. Fun but ultimately unfulfilling. Thanks for reading my opinion. Great game for Axis & Allies fans OR other gamers. The replay value is more limited than the larger strategy versions of Axis & Allies. It is one of my favourite “Theater” War games however do to it’s short length and easy game play. A good “into” game for rookie wargamers. I wanted to like this version as it is a 2-3 player game. But after a few plays I did not see how the Germans can lose. Add a Review for "Axis & Allies D-Day"